H-E-B highlights, in one of its latest commercials, that H-E-B’s Natural Meats are 100% natural with no antibiotics or added hormones. 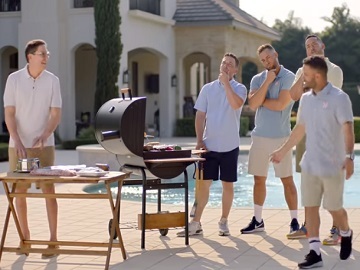 The spot, a sequel to 2018’s “The Dream” entitled “The Dream II,” opens with Houston Astros third baseman Alex Bregman grilling items from the grocery retailer’s natural meats line, including beef, chicken, and pork. Outfielder George Springer, second baseman Jose Altuve, and shortstop Carlos Correa join him, saying the products are perfect for the four of them. Altuve starts imagining other things that would be perfect for them, such as painting, playing a game of chess on a giant chess board and forming a rock band. The four teammates co-star in other ads, as well. In one of them, they compete in poetry, singing, dancing and juggling contests in the battle to win the role of spokesperson for H-E-B Creamy Creations Ice Cream. In another one, that focuses on H-E-B’s “heat and eat” option: Meal Simple, Altuve and Springer build a robot chef.